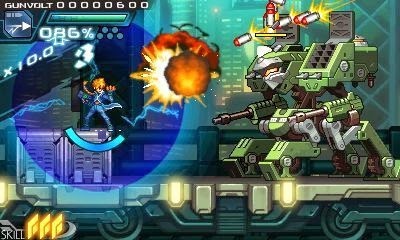 Azure Striker Gunvolt for the Nintendo 3DS is a brand new game from Mega Man father-figure Keiji Inafune and Inti Creates. Given the powers involved, one could easily write this one off simply as a spiritual successor to Mega Man Zero and Mega Man ZX (both developed by Inti). But Gunvolt is more than that. The "guns ablaze" spirit of Inti Create's popular Mega Man offshoots is indeed alive and well here; but at its core, Gunvolt shines as something new entirely. Gunvolt takes place in the near future, a time of great technological prosperity and achievement. An enigmatic conglomerate known as the Sumeragi Group has imprisoned wielders of psychic powers, individuals collectively referred to as the Seventh. Sumeragi's suppression of the psychically adept was a self-declared act of peacekeeping, fearing they would bring chaos and ruin to the world. Those incarcerated by Sumeragi are subject to inhumane experiments in the name of "research." In response, the resistance group "Feather" is formed -- a team of psychics which includes our titular blond hero, Gunvolt. Their goal is simple: destroy Sumeragi with extreme prejudice. The plot further unfolds as players begin their first mission. Gunvolt busts into a Sumeragi compound, tasked with destroying an artificial life form created by the sinister conglomerate. The target turns out to be a 13-year-old girl named Joule. Gunvolt's consciousness refuses to bend to his superiors' orders, and he chooses to save Joule, forfeiting his position as a Feather operative in the process. There is a lot of story presented to the player over the course of this three-four hour game, most of which feels more "safe" than ambitious. Still, what we've got is good enough to provide a nice backdrop for the action. And man, there is a lot of action! Controlling Gunvolt, players of the Zero and ZX series will feel right at home. Our hero can dash with ease (defaulted to the L button), jump-kick off walls, and shoot. Now that's the part where things get interesting: you can shoot all you want but you won't deal much damage. You see, Gunvolt's gun is used to "tag" enemies. By default, you can tag up to three enemies on-screen, or go all out and tag one enemy three times. Once tagged, you're ready to unleash Gunvolt's primary weapon, the Flashfield. Activated with the press of the R button, the Flashfield emits waves of electricity that homes in on your targets. This deals heavy damage, more so if you focus your attack on a single foe. Gunvolt's Flashfield is a very convenient means of maneuvering about, too. The Flashfield allows Gunvolt to glide for a brief period of time, perfect for navigating your way through pitch-black corridors or dodging a barrage of spikes. It's pretty nifty. Dashing, tagging enemies, and belting out the Flashfield presents a fluidity to the game not entirely present in Mega Man X, Zero or ZX. Every move and action you make feels like a dance. It's incredibly satisfying watching yourself do all this cool stuff. Seriously, Azure Striker Gunvolt does a damn fine job of making you feel cool. At one point during your playthrough your immersion will break and you'll say to yourself, "Oh my god, I can't believe I'm doing this." With Gunvolt, everyone looks and feels like a speedrunner. Now, I gotta say this feeling won't come to you instantaneously. You have to get the hang of Gunvolt's deliberately restricting gameplay mechanics before you blaze through stages like The Fist of the North Star. You know that super cool Flashfield, right? Well it's tied to a meter that depletes with each passing second. Once this "EP" meter has completely depleted, Gunvolt will go into an "overheat" phase. Here, the Flashfield is unusable for a few moments. You'll have to wait for it to recharge. If you have a certain Skill, however, you can recharge it instantly. The point is, though, you'll have to carefully judge when and how long to belt out the Flashfield. Use it wisely if you don't want your dance to be hindered. This brings us to another ability of Gunvolt's called "Prevasion". 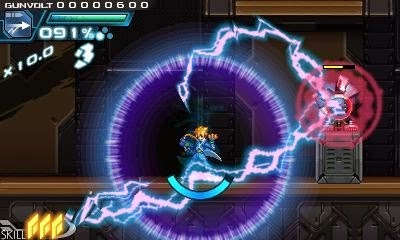 Gunvolt can dodge pretty much any attack in the game when you're not using the Flashfield. Prevasion shares the same EP meter as the Flashfield, depleting with each hit Gunvolt takes. It's an interesting gameplay element, one that honestly removes some of the would-be-challenge. You can even safely dodge boss attacks and clear whole areas without so much as a scratch. If you're up to a challenge, you can remove the Prevasion ability from Gunvolt's arsenal. In tried and true Mega Man fashion, Gunvolt can access a wide array of skills and special attacks. These skills are dictated by the player's level, anchored by an experience point system. Gunvolt can equip up to four Skills at a time. There isn't much in the way of variety here -- Skills are either powerful attacks (complete with dazzling animations) or health/EP recovery. Each Skill comes at the cost of Gunvolt's Skill points, of which he has three. Skills points can be replenished over time but I feel you're better off saving these for boss fights. Graphically, Gunvolt is a natural extension of the tried and true style of Mega Man Zero and ZX. The stages are pure eye candy, decorated in familiar environments that will make any fan smile with glee. Sprite animations are the best Inti has done and there's a lot of neat little effects to ogle at (stand still and look at Gunvolt's feet!). There is a severe lack in enemy variety, though; but what you do see is right out of the Zero/ZX design book. It's no exaggeration when I say you'll face the same four-five enemies over and over. At least they look nice. Ippo Yamada's score is decent though not quite as spectacular as his work on the Zero series. There's four really good pieces ("Adept" being my personal favorite), but I'm disheartened to say the majority is pretty forgettable. I have to admit there were times when I completely tuned the music out, pulled up a piece from Zero on YouTube, and played to that. 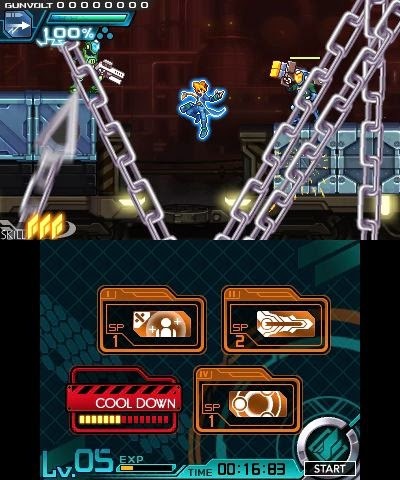 At the end of the day, Azure Striker Gunvolt presents a unique and technical take on the Mega Man formula. I don't want to say this is the next natural step in the formula, but it is indeed a faster take on Inti Creates' previous work. Mastering it has been one of the more satisfying gaming experiences in recent memory, and you'd be hard pressed to not attempt to S+ rank each stage. 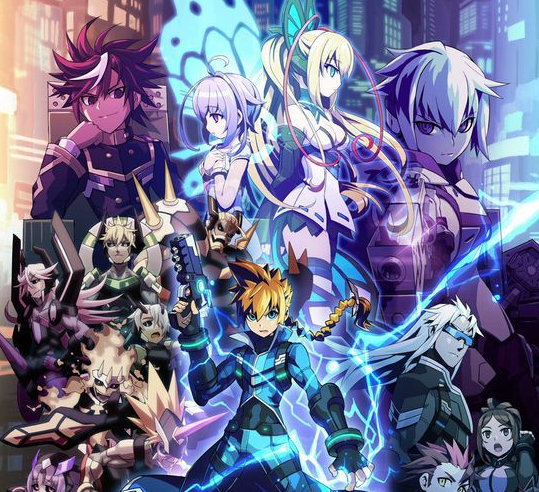 Although there are a few problems keeping it from achieving Mega Man Zero-levels of greatness, Gunvolt is a fun romp and a must-have for fans of fast paced 2D action. P.S: I'm giving away three free Mighty Gunvolt codes. Check back soon! Azure Striker Gunvolt is available tomorrow, August 29th on the Nintendo 3DS eShop for $14.99 USD. Mighty Gunvolt available free with purchase Until November 28th. Thanks to 8-4 for providing early review copy. This seems mighty intresting! maybe they can iron out most of these flaws in a sequel. Awesome! Nice to see you are covering the release of this game. It completely fell off of my radar - thanks for the reminder. Got to go buy a copy now. Thanks Protodude, for the seemingly really fair and honest review. I guess I have to think of this game as a score breaking, fast paced, action game more so than a challenging, 2D-platformer right off the bat. Man really disappointed to see that review for the music, but such is life, you win some you lose some. I will however formulate my own opinion of the music, once I listen to it personally. Anyone else get an Akira vibe from the story, or is it just me? Probably me. It sounds like an interesting game, though I think I'll still pass on it. Zero was fun and a great series, but I don't think I feel the same about Gunvolt. I have a question: i am thinking on buying a 3ds on december, will mighty gunvolt be available for download then (paying of course)? Yep. Just not for free. "It makes no sense to not play for the story"
While it is good for games to have a good story (specially in RPGs), I think gameplay is more important. Most games from old times had a simple story, and if it didn't fit in the game (due to limitations), it was added in the manual and guide books. what time is this game gonna be released? do you know how long ive been anticipating this game? imagine hearing about an amazing video game and getting hyped up for it, each day counting down the hours and minutes untill the release date of said game, waking up on release date only to find that you cant download it yet. seriously this is irritating I want to play this game how much longer do I have to wait?! Story wise it feels like either X-men, Bloody roar, or Infamous Second Son.